If I had to pick just one type of meal to live on for the rest of my life, it would likely be some type of plant-packed bowl. Although I don’t often share photos on Instagram of my evening meals, you can bet that 99.9% of the time I’m eating a bowl of greens, topped with quinoa, lentils, broccoli, carrots, green peas or other veggies, along with a side of hummus and kimchi. Now that is my kind of meal. Often simple, and always nourishing, vegan bowls are where it’s at these days, as many bloggers are professing their love for these one-dish meals. 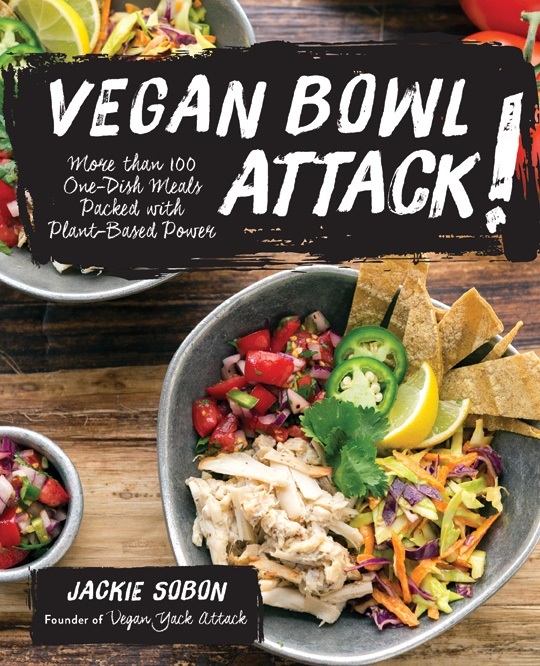 Lucky for us, my friend Jackie Sobon of the popular Vegan Yack Attack blog recently published her first cookbook—and it’s all about bowls! Inside you’ll find more than 100 one-dish, plant-based bowls that are sure to please any appetite. 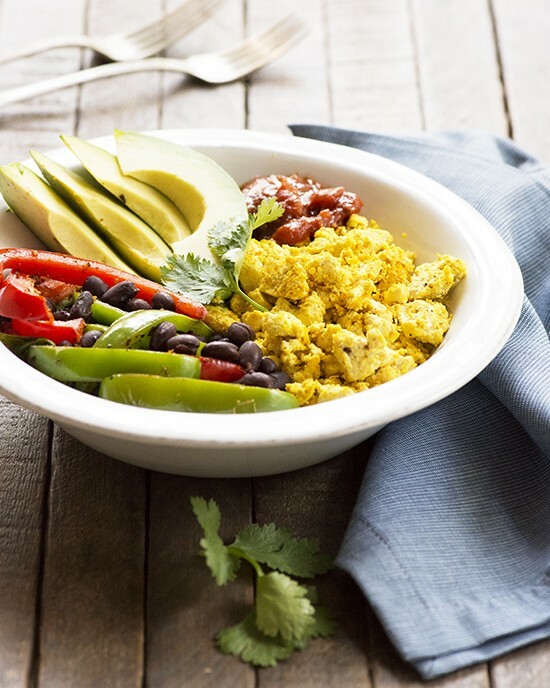 Within the book’s seven chapters, Jackie shares recipes for breakfast bowls, lil’ snack bowls, soup and salad bowls, entrée bowls, dessert bowls, and bowl essentials (sauces, spreads, dips and drizzles). She covers a wide spectrum of unique and traditional dishes, taking inspiration from an array of culinary styles and ethnic cuisines. From the Bountiful Breakfast Bowls chapter, I stumbled upon a recipe for a scramble burrito bowl and had to give it a try. Despite the fact that most of the dishes in this book require multiple recipes, this one came together easily. 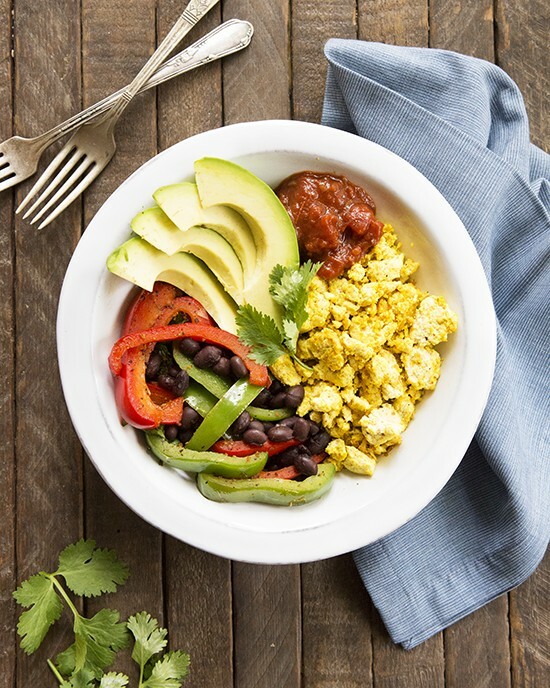 The scrambled tofu is simple and only requires tofu, nutritional yeast and a couple of spices, and I was pleased to see Jackie’s instructions to use the same pan to cook the fajita veggies as well. Overall this was a simple and very satisfying meal, and I know I’ll be making it again. Aside from the obvious appeal of the book’s subject matter, Jackie did double duty by not only creating all of the recipes but also photographing them herself too. I know from experience that that is an incredible feat, so it’s wonderful to see her hard work shine through in this beautiful book—and did I mention it’s a hard cover? Grab your bowl and an appetite and dig in with this sample recipe from Vegan Bowl Attack!, plus enter to win a copy of the book below! To make the tofu scramble and fajita veggies: In a large, cast-iron skillet, warm the oil over medium heat. Once hot, use your hands to break the tofu apart into large crumbles into the skillet. Brown the tofu for 2 to 3 minutes and then stir it around to brown the other sides. You want it to have a light brown crust on a couple of sides. Next, adjust the heat to medium-low and stir in the nutritional yeast, turmeric, and Indian black salt until the scramble is evenly coated. Season with salt and pepper, and push the scramble to one side of the skillet. Place the red onion and bell peppers into the other half of the skillet and sauté until the onions become translucent. Add the black beans and spinach, cook until the spinach has wilted, and season with salt and pepper. Thanks to the folks at Fair Winds Press, I’m able to give a copy of Vegan Bowl Attack! to one ADC reader! The giveaway is open to residents of Canada and the US. If you’re feeling lucky, enter using the widget below and I’ll choose a random winner on Wednesday, August 24. Good luck! i love a burrito bowl ! I love all things in a bowl but stir fry bowls are my favourite with brown rice and baked tofu! For breakfast I had a bowl of cereal with fresh berries!! I love greens, beans, and grains bowls. Top with some hot sauce and it’s perfection! Ohoo, kale, vegan sasuage, brown rice, with roasted pepper sauce! The Thai bowl at Aux Vivres in Montréal is one of my favorite bowls. Tofu, rice, carrots, daikon, bok choy, peanuts, and their delicious peanut sauce to bring it all together – not to forget the cilantro! It’s just great. I love bowls too! my favorite combo as of late is farro, roasted eggplant and zucchini, baked tofu and hummus thinned into a sauce. I love quinoa and vegetable bowls! 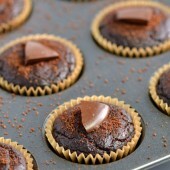 Can’t wait to try this bowl version, so yummy! My favorite meal in a bowl is what I call my “kitchen sink salad” bowl I go through my fridge and find all the leftover vegetables, grains, toppings, etc. and make a meal out of it. I’ve discovered that many different kinds of leftovers like ratatouille or curries can be great “dressings” for this kind of salad. I love a chili and cornbread bowl! My favourite meal in a bowl is pasta with veggies and a cheese sauce. Hmm, probably the Pizza Bowl from Isa Does It! Vegan sausage, kale, and mushrooms sauteed over quinoa with a yummy cashew roasted red pepper sauce! I love to make sushi bowls, or thai bowls! Brown rice, kale, beet, carrot and tempeh !! Yum!!!! I love brown rice, steamed kale, tofu and peanut sauce, topped with cilantro. Yum! I could live on bowls, really. Thanks for the recipe and the giveaway! Sushi bowls are a fave. I love OSG’s burrito bowl and CCK’s cauliflower Alfredo. Both are in regular rotation at our house!